This ice cream was inspired by a visit to Humphry Slocombe, a deliciously wild ice cream shop here in San Francisco known for a fun repertoire of off-the-beaten track ice cream flavors. Although it may sound like an odd idea, I do happen to love the unusual and earthy quality that herbs add to ice cream. 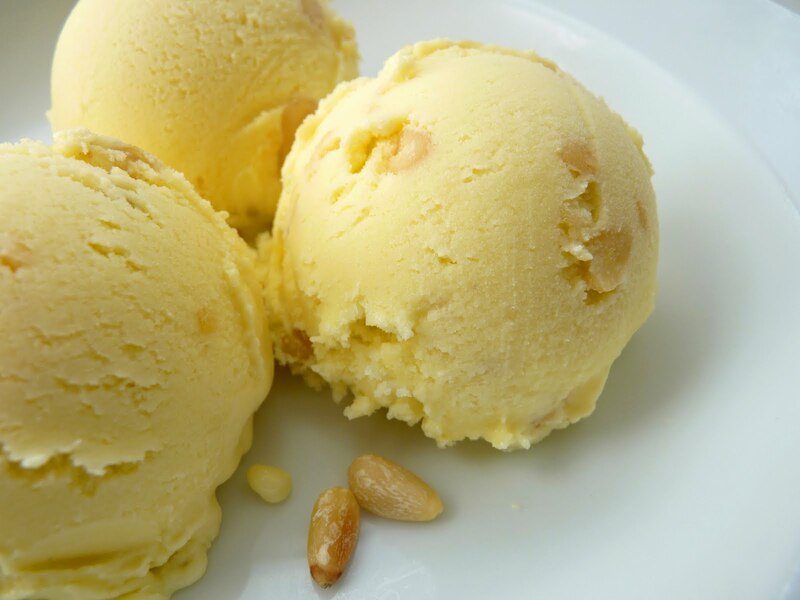 And as it turns out, this Pine Nut Rosemary Ice Cream is a really satisfying and delicious combination of flavors and textures. Humphry Slocombe debuted a couple of years ago, tucked away in an historic neighborhood that boasts Dynamo Donuts, a very popular donut scene with a similar innovative attitude, and a great Mexican delicatessen and market that's been in the neighborhood for years, a place where you can watch women making homemade corn tortillas the old fashioned way. It's always fun to search out local shops that use the best ingredients and methods. The sights and smells in these places are amazing. Since its inception, Humphry Slocombe has been drawing the infinite curiosity of ice cream lovers far and wide. And now we learn that they have a book of their recipes due out from Chronicle Books in Spring 2012. Oh my! 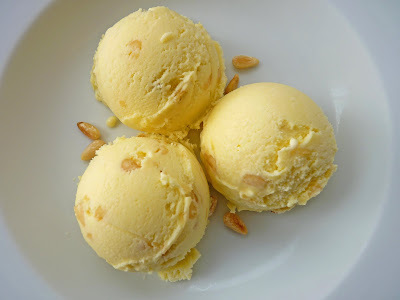 Until that recipe book comes out, I won’t know for sure how they constructed their Rosemary’s Baby ice cream, but I’ve put together a version that incorporates some very basic ingredients. I start with rosemary steeped in a basic custard to which I’ve added some honey. I also thought it would be fun to add a little dab of delicious extra virgin olive oil. Toss in some toasted pine nuts and it’s over. I don't know if my version is close but it's pretty intriguing and delicious. I love the pure and gorgeous beauty of plain vanilla and chocolate ice cream as much as anyone. But I also love that ice cream is such a fantastic medium to experiment with a whole range of flavors and textures. So I encourage you to fire up your ice cream maker and try something new. Think about your very favorite flavors and see if you can transform them into a delicious ice cream. The sky really is the limit. - When I refer to "rosemary sprigs" in the recipe, I mean sprigs that are about 4” long. So the recommended amount would be about 8” to 10" of rosemary sprigs. This doesn’t need to be absolutely precise since you’ll be tasting for strength during the steeping period. The sprigs are steeped whole; no need to remove the leaves from the stem or chop them. - Toast the pine nuts in a dry saucepan over medium heat, swirling the pan to keep the nuts from scorching. - Use a good quality brand of extra virgin olive oil. I used California Olive Ranch Arbequina, which I love using for pastry and desserts. 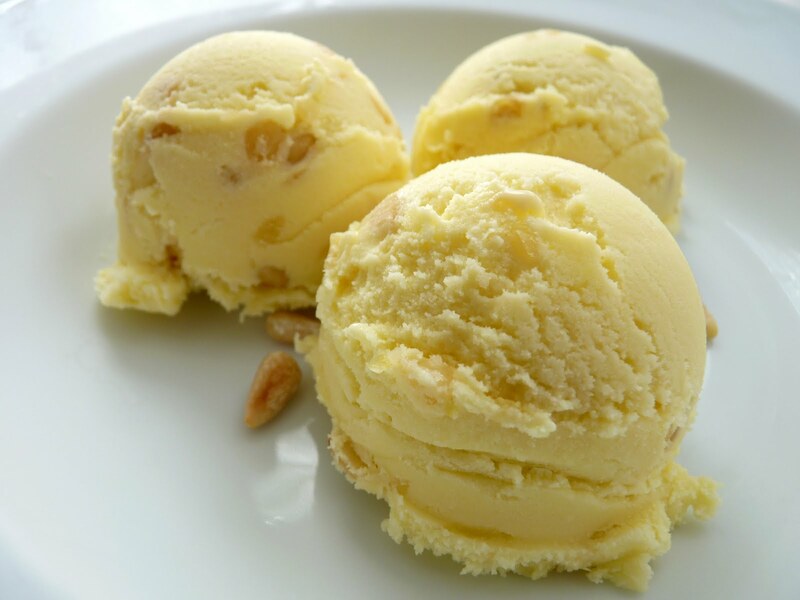 - The sensation of richness in ice cream is a result of the ratio of cream to milk and the amount of egg yolks. I tend to like my ice cream moderately rich, so I prefer to use less cream and fewer yolks, but it all depends on the flavor of the ice cream and whether there are other elements to consider. You can adjust the proportions to suit your own level of desired richness and mouthfeel. Pour the cream and milk into a saucepan and add the sugar, honey and salt. Simmer over medium low heat until the sugar and honey are fully dissolved, stirring to distribute. Remove from heat and add the rosemary sprigs. Cover and steep for about 20 minutes to a half hour, tasting after 20 minutes for strength. When you have the right flavor, strain out the rosemary and return the mixture to low heat until barely simmering. Whisk the yolks and slowly add the warm cream mixture, whisking constantly to prevent any curdling. Pour the mixture back into the pan and return to medium low heat. Stirring constantly with a heatproof spatula, cook gently until the mixture thickens slightly. This takes just a few minutes. It should coat the back of the spatula and when you run your finger through it, it leaves a trace. Take off the heat immediately and pour through a strainer into a clean container. Whisk slowly to cool. Stir in the olive oil. Add salt to taste. When completely cooled, cover and refrigerate overnight. Toast the pine nuts in a dry skillet over medium heat until lightly browned. Set aside to cool. 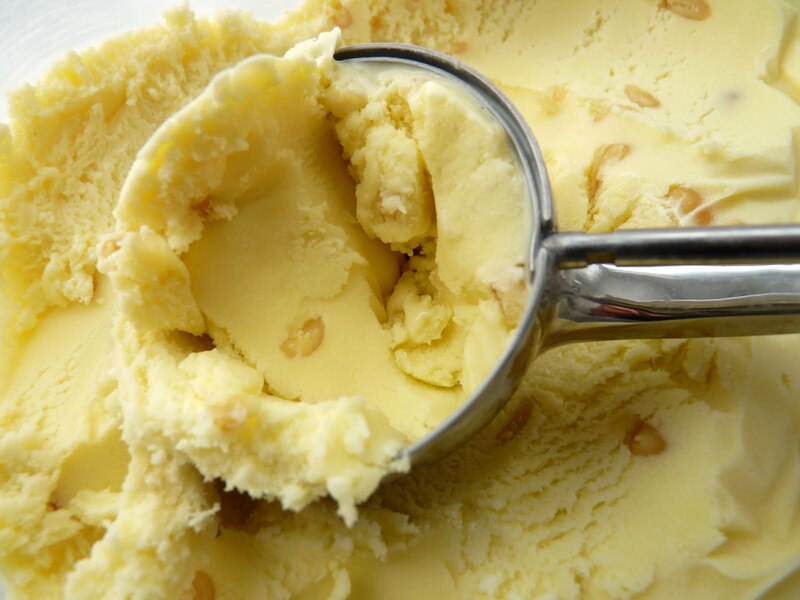 Freeze the mixture in your ice cream maker. Fold in the toasted pine nuts. Pour into a clean airtight container, press a piece of plastic wrap on the surface and cover. Place in your freezer to firm up. This looks just scrumptious. I love pine nuts in anything - especially pignoli nut cookies from Rocco's on Bleecker Street and Jody Williams' meatballs with currants and pine nuts. HELLO, Victoria!! Hope all is well. I'm a pine nut lover, too. I remember the first time I had pinolate, I thought I was in heaven. And those meatballs you mention sound delicious! I love sweet ice cream being mixed with such unique, out of the box ingredients. First time here and I enjoyed going through all your posts and was very impressed with not only your recipes but also the details and descriptions that you have managed to give. This studio of yours is useful and very informative. Howdy BakerbyNature and vimala, welcome to my blog. I hope you continue to enjoy reading my posts as much as I enjoy creating them! Hi P.S. Made my own version of this today. I reduced the sugar to 1/4 cup and steeped the rosemary in 1/3 cup of local honey. I am toying with the idea of candying the pine nuts and sprinkling them over the top. Thanks for the great recipe! Hi Sharon T, that sounds like a good alternative approach. I hope you enjoy it! !